When it comes to grilling, I will willingly admit I am not the queen of the barbecue. Perhaps it's because I never made it all the way down the line to the grill when I worked in professional kitchens. 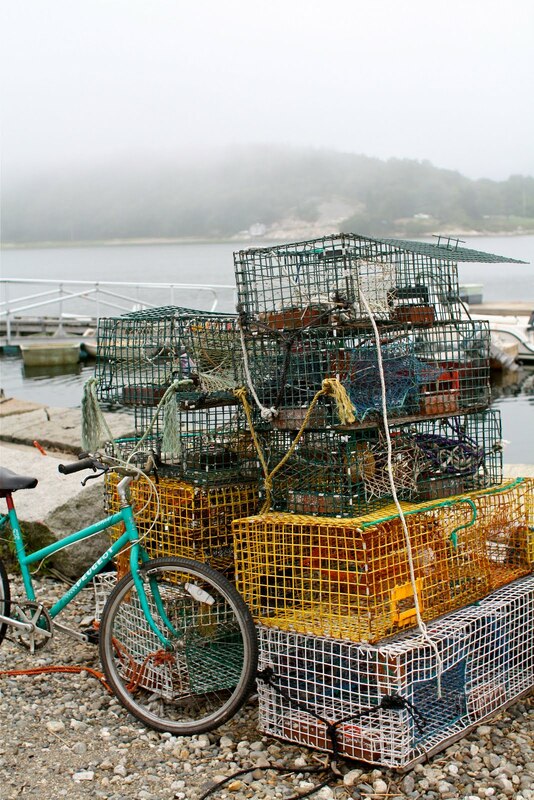 I always got hung up on the fish station, just past the hot entrees. Roasted lobster tails, delicate quail breasts and juicy raw scallops all fell under my knife, but I never got to hear the sizzle of the grill as it marked slab after slab of red meat. Then we lived in a downtown apartment for several years. 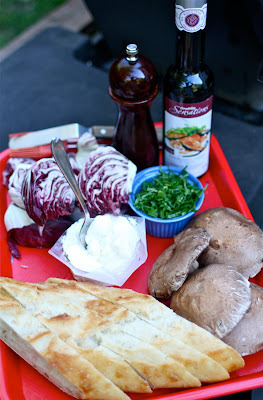 There's not much room on a tiny Plateau balcony for a barbecue, especially with all the herbs I grew. Again, no grill experience for this girl. Eventually I found myself in semi-suburbia, with two kids, my trusty tongs from the old restaurant days, and -uh oh!- a grill. 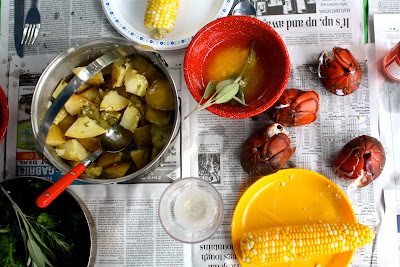 Now, thanks to inspiration from the kind folks at Sobeys, who sent me a grocery gift card and practically propelled me in the direction my barbecue, I'm bringing you a couple of grilling recipes that I feel confident about. 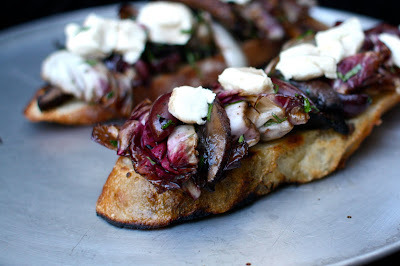 First up is this bruschetta, my interpretation of a Sobeys recipe for a warm grilled radicchio salad. 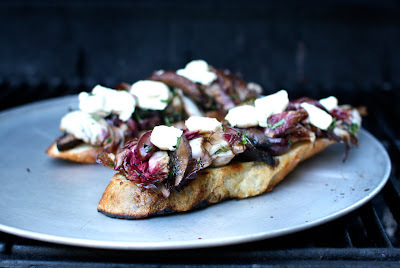 I can definitely stand behind this bruschetta, with it's warm chevre, silky portabello mushrooms, and chewy bread. 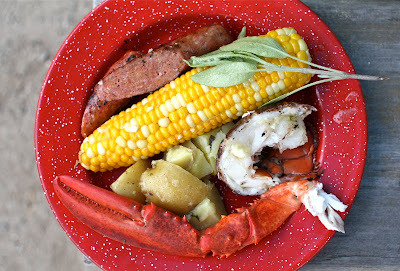 Perfect for a warm summer night, all it needs is a glass of red wine to keep it company. Don't be nervous about the bitterness of radicchio. The grilling brings out this green's sweeter side, and the balsamic vinaigrette add the perfect balance. Brush mushrooms and radicchio lightly in olive oil and grill over medium heat until mushroom are soft and radicchio is wilted. 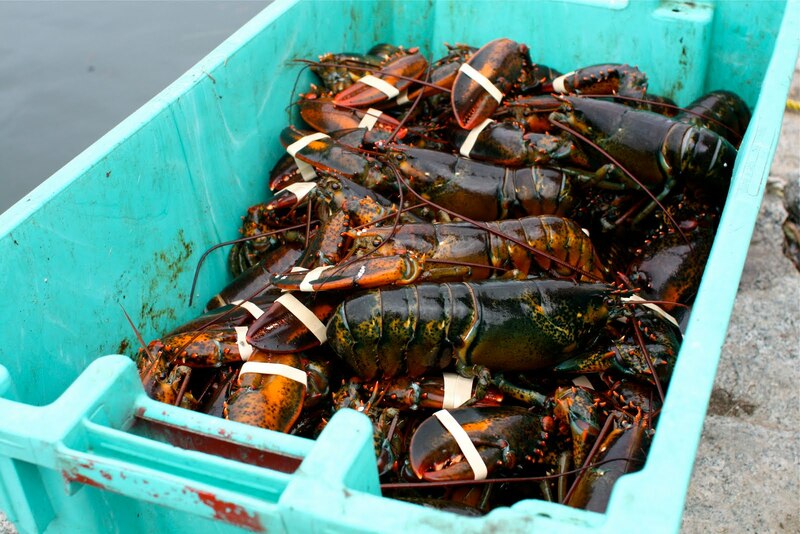 Remove from grill and roughly chop. Transport to a bowl and add the olive oil, balsamic, olives and parsley. Toss together and season with salt and pepper. Butter bread lightly and grill until slightly charred. Transfer to a pizza pan or heatproof serving platter. 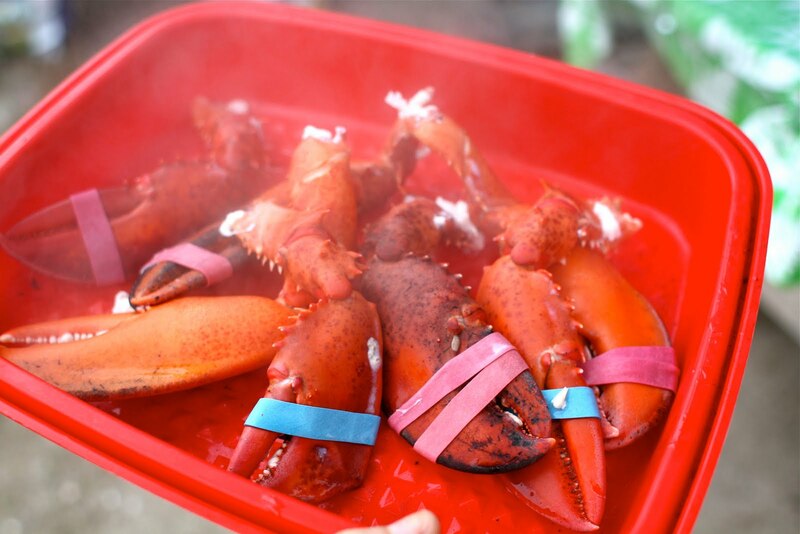 Lower the heat on the grill. Mound radicchio & portabello mixture on top of grilled bread and dot with chevre. Place pan with bruschettas back on the grill and lower the lid of the barbeque. Turn off grill and allow the cheese to soften and the entire bruschetta to warm. 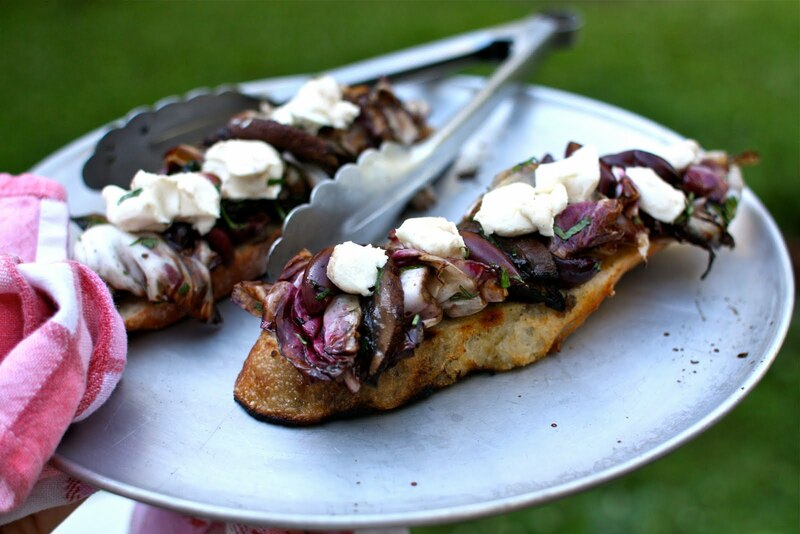 Pour wine, serve bruschetta and enjoy! 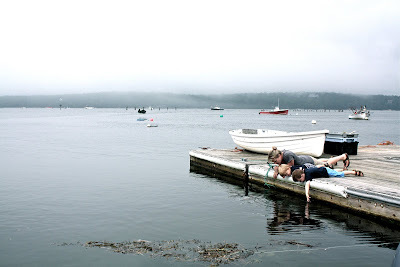 We're back from a five-day camping trip on the bewitchingly beautiful Maine coast and I have to tell you, I've fallen hard for the sea. Falling asleep to the sound of the surf, walking on the beach in sun or fog, the surf...ah, we were absolutely swept off our feet from our mini-vacation. 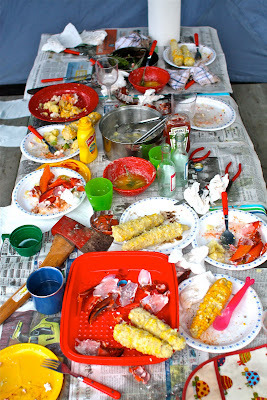 I'll be giving you the full rundown of our adventures -a tornado, my first lobster roll, an overly friendly skunk in our camp, and plenty of good eats -shortly, but right now we're busy dealing with the camping aftermath of sandy laundry, sticky dishes, and tired, sun burnt kids. 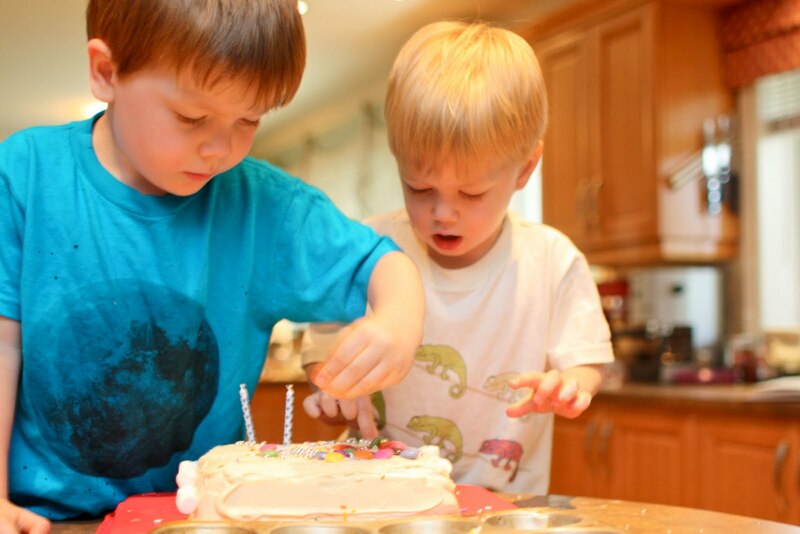 We've got our hands full! 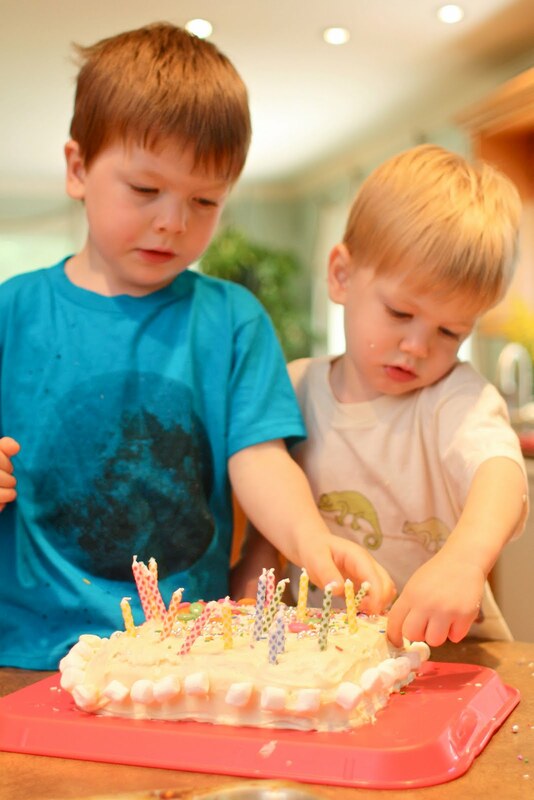 I was thrilled to be featured on the Cafe Mom food blog, The Stir, last week. 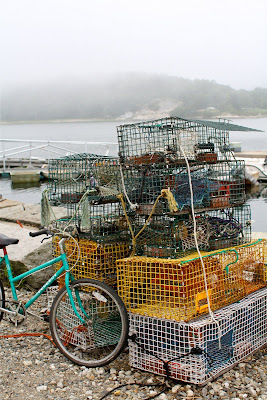 The lovely Kim Conte interviewed me and we chatted about my family, cooking, blogging and Simple Bites. 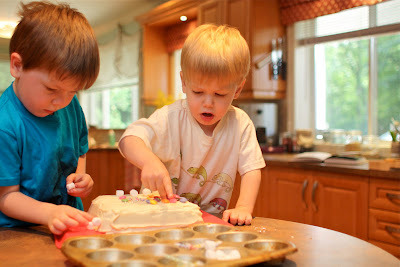 Included in the feature is a full photo tour of my kitchen, so you can see where all the action takes place. 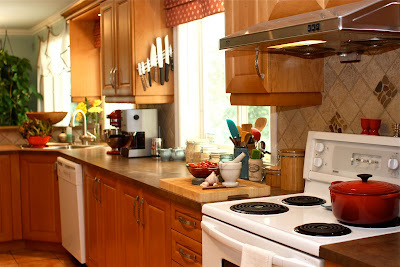 Check out my favorite spot for morning coffee and email check, as well as the counter where I Tweet-&-Cook, a favorite pastime. Of course I threw in some family shots and plenty of food photos to make you hungry, too! Head HERE for the full interview on The Stir. 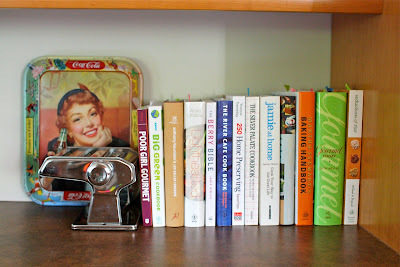 My cookbook collection has expanded considerably this summer and the content has gotten much, much richer. I use to be a collector of coffee table cookbooks - pretty to flip through, but not so practical for the home cook- but nowadays, I'm all about practicality and application. Yes, gorgeous photos are still appreciated, but writing, style, fresh ideas and personality all take precedence as well. 250 Home Preserving Favorites by Yvonne Tremblay. If there is a Canadian queen of jam, it's probably Yvonne. She's pretty much the quintessential Prairie girl who grew up making jam & jelly alongside her mother and grandmother. Fortunately for us, she shares her favorite recipes in this new cookbook that is jam-packed (terrible, pun, I know) with inspiration. 250 Home Preserving Favorites begins with a thorough primer on preserving (Thank. You. Yvonne.) covering everything from The Fundamentals of making jam to Choosing and Preparing Fruit & Vegetables. The entire section is crammed with tips, obviously learned from years of experience and is worth the price of the book alone. Yvonne already won me over with her Micro-Mini Jams, explored and tested over at Simple Bites. The book also contains a bevy of both single and mixed fruit jams, conserves, marmalades, fruit butters (we love those!) and chutneys. Oh, there's also a few mincemeat recipes. You'll recall I made mincemeat for the first time last Christmas. Well, I'll be giving these new recipes a go come November. 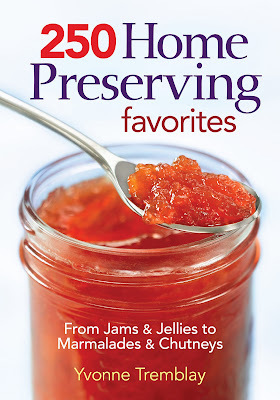 Ideal for the fledgling or veteran jammer, I recommend 250 Home Preserving Favorites for anyone who loves preserving food in jars. Yet another Canadian girl! 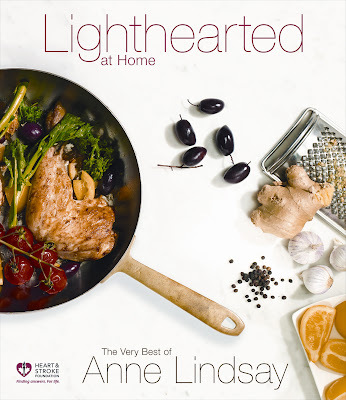 Culinary icon, Anne Lindsay is probably familiar to many of you and in this new cookbook she gives us over 500 --um, wow!-- recipes with a 'lighter' side to them. Basically, I've adopted this cookbook as my new 'Joy of Cooking'. 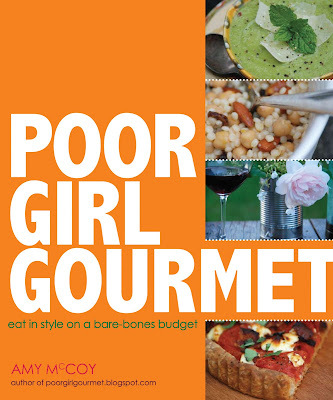 Anne pack so much into this hefty hardcover book, with recipes from appetizers to desserts and everything in between. The hard part? I want to try everything! Recipes are easy to read and follow, the photos are splendid, and the tips on healthy eating an added bonus. I particularly love the creative menu planning ideas, as I entertain often. Lighthearted at Home is an extremely well-rounded, feel-good cookbook. 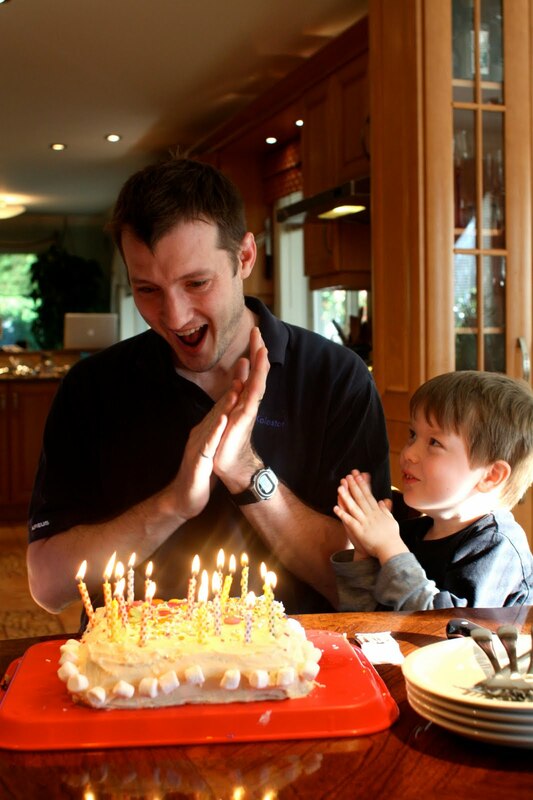 It's one you want to buy and slip into your kids' suitcase when they leave for college. 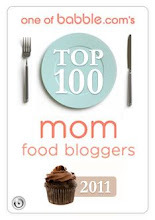 I can't wait to try the other, oh, 490-some recipes, that are calling to me! 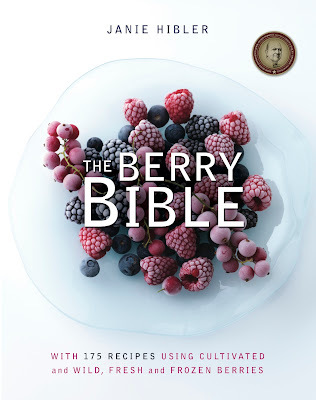 The Berry Bible by Janie Hibler. Who doesn't love berries? OK, my kids don't, but that is besides the point. 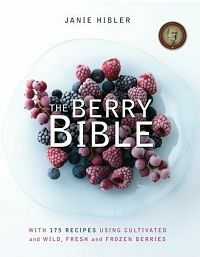 I'm loving my advanced copy of The Berry Bible and its 175 recipes for berries of all kinds. These are gorgeous and original recipes; just the section on poultry paired with all sort of succulent berry sauces and glazes is enough to get the tummy really, really rumbling. Oh, and did I mention that the first half of the book is an A-Z encyclopedia on berries worldwide? Yep. There's no question this is Janie Hibler's area of expertise. Just one quibble about the Berry Bible: no photos. Yeah. Now, I read cookbooks the same way others read novels, I'll devour them, photos or no photos, but this could be an issue for those of you who are more visual. However, my advice? Get in line for a copy of The Berry Bible. I've already waxed eloquent over my love of Amy's cookbook, but in no way has it gotten shuffled to the bottom of the pile or pushed aside as new books arrive. It stays on my counter with my other favorites (pictured at the top of the post) and is getting plenty of use. 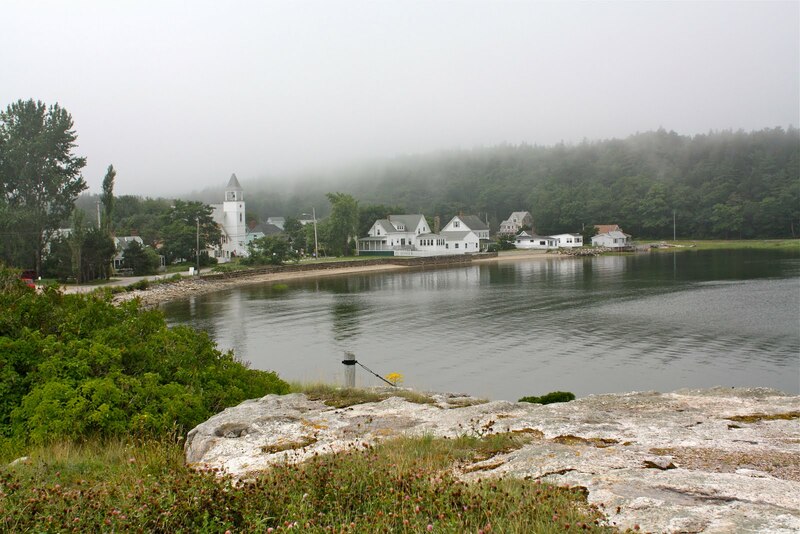 In fact, I'm packing a jar of her Tangy Barbecue Sauce for our upcoming camping trip to the Maine coast. 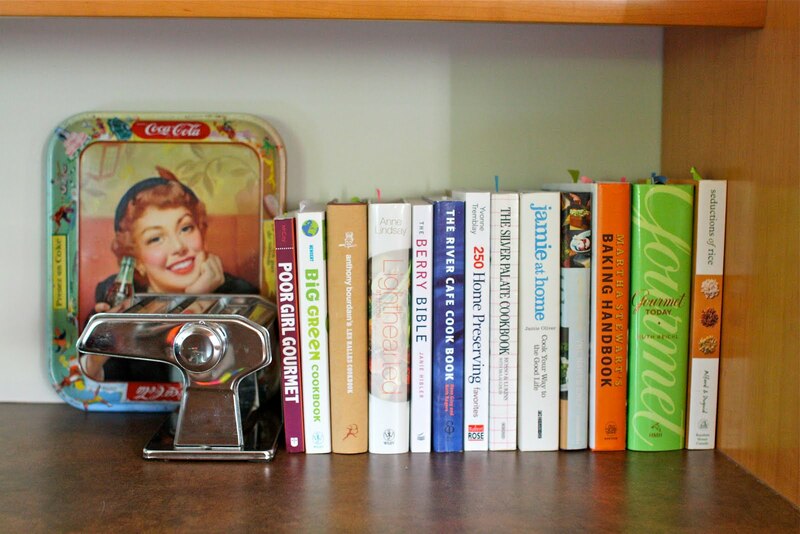 Sure, go ahead and leave a comment: What cookbook is getting the most use this summer in your kitchen? Don't be surprised if I keep bringing back recipes from foods we enjoyed during our family reunion. 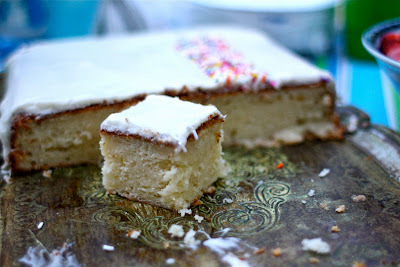 Like this yogurt sheet cake (which I had made before, loved, and never got around to sharing...oops!) and birthday cake for my brother's little guy, Jesse. The little sweetie turned two while they were here and it was my absolute treat to be able to bake his cake. A sheet cake was perfect for this event; I didn't want to spend the whole afternoon in the kitchen, yet still wanted something that felt festive. This recipe comes together quickly, and the frosting is poured over the top and left to run down the sides in the true unhurried fashion of lazy summer cooking. 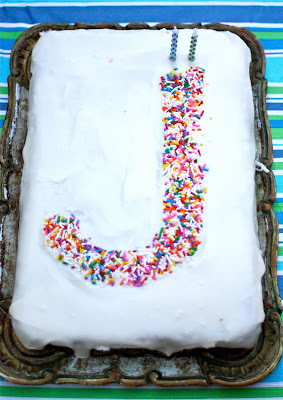 For the simple decoration, I cut a 'J' stencil out of cardboard, lay it on the cake and generously doused it with sprinkles. 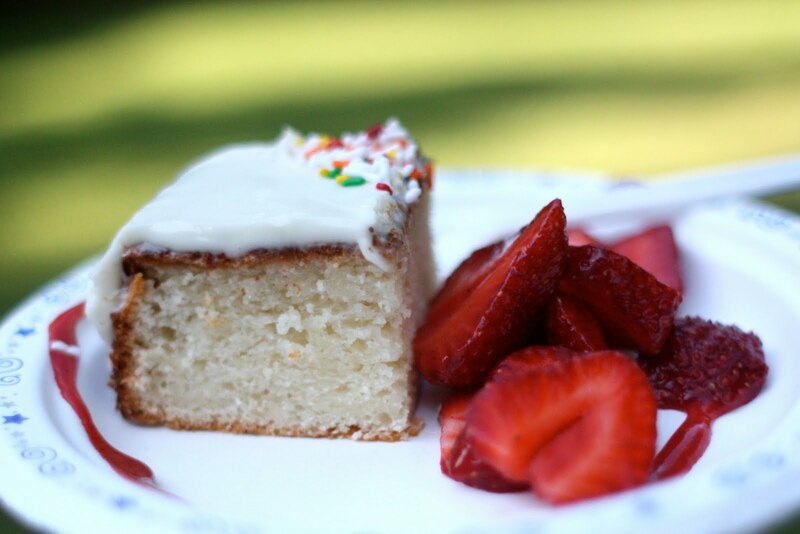 Pair this cake with any berry you like, whatever is gorgeous and ripe at the market or in your backyard. 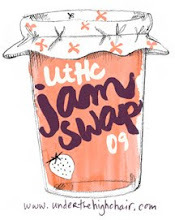 It was strawberry season in June and we were bringing home a flat of 6 pints from the market every day. 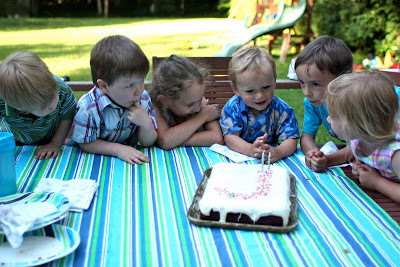 The ripest ones got whizzed into a coulis along with some vanilla sugar and the rest were sliced up and served alongside the cake. I love this cake, not just for its simplicity, but for its tender crumb, too. No doubt the cake's moistness is a result of the two cups of yogurt, and the cake flour certainly contributes to its tenderness. 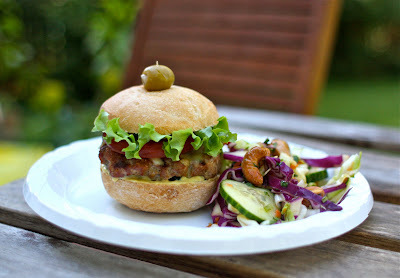 Thanks to Gourmet magazine for this recipe. Can we just take a moment for my favorite magazine, please? 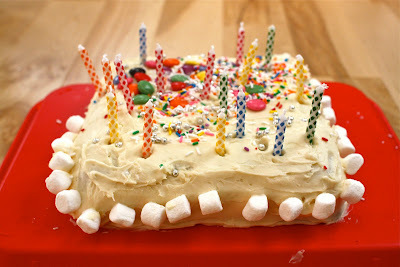 This cake was featured in the August 2009 issue (to date, my favorite issue). Makes 1 9x13 sheet cake. Serves 12. Preheat oven to 350°F with rack in middle. 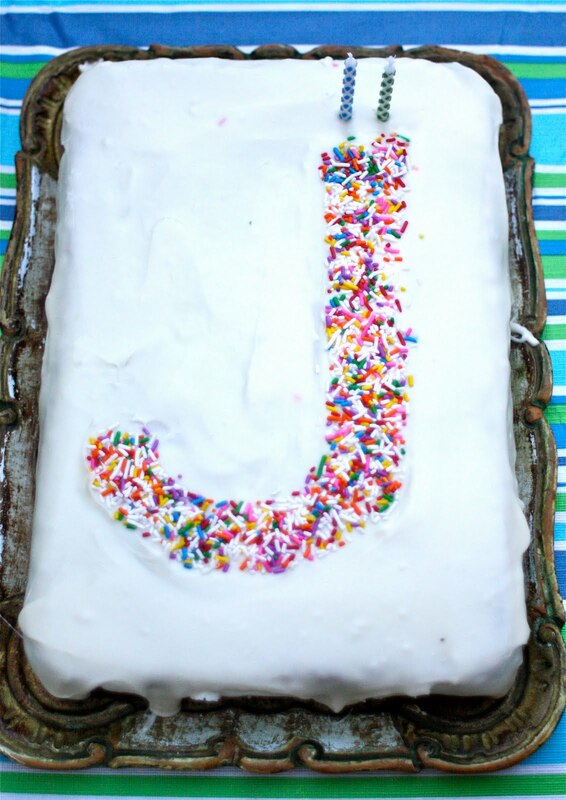 Butter a 9x13 cake pan, then line bottom with a rectangle of parchment paper and butter parchment. Dust with flour, knocking out excess. 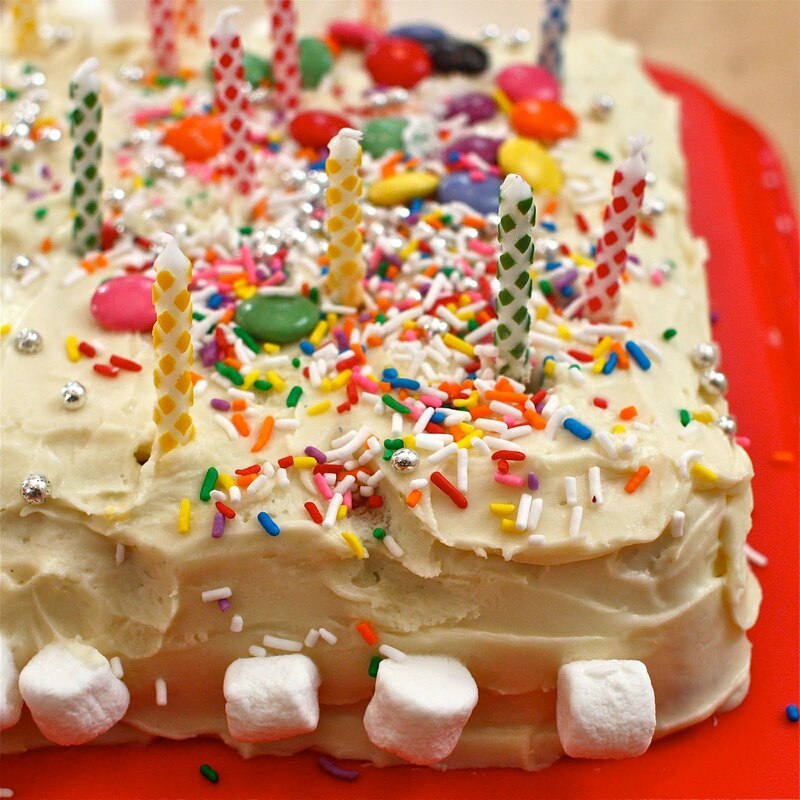 Put cake on a platter and spread icing on top in a thick layer, letting it run down sides. 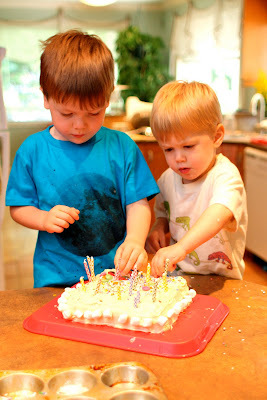 Let icing set at least 15 minutes. 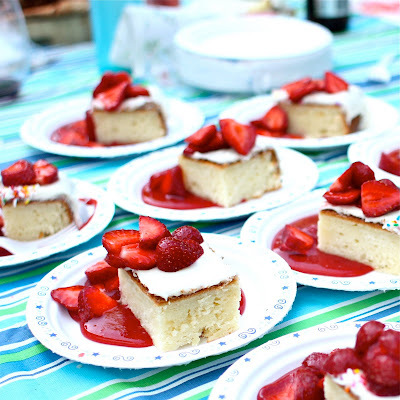 Serve with plenty of fresh berries and a strawberry coulis. Master Your Muffins with Aimee Wimbush-Bourque of Simple Bites. It's an honor to be featured! 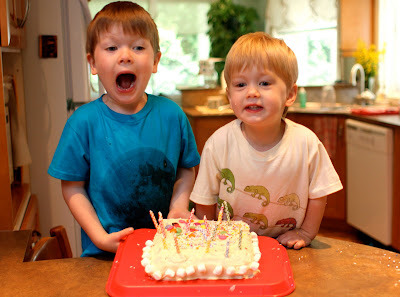 ** Noah and Mateo are wearing 'Luna' and 'Chameleon' tee's from Barley and Birch's Spring 2010 collection. Meet Shannon, of the inspiring blog, Nourishing Days! When I was probably about four years old my parents took me blueberry picking where we lived in northern Minnesota. They were wild blueberries and we went out and picked them with ice cream buckets. It was lovely. For breakfast I had a green smoothie + a coconut flour pancake. Lunch was a big salad with avocado, leftover roasted chicken, homemade mayonnaise, and a whole bunch of homegrown lettuce. Dinner was chicken liver pate with zucchini and cucumber "crackers" along with a roasted butternut squash with butter. 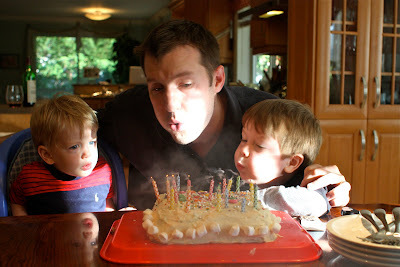 We also had a big mug of coconut milk hot cocoa after our boys went to bed. Margarine or anything that might resemble butter but isn't. Kerrygold butter, organic carrots, at least two kinds of mustard, raw blue cheese (can't get enough of this lately), and homemade yogurt. Since the heat has returned it would have to be kombucha. It's a fermented sweet tea that gets really bubbly and is super refreshing on a warm day. The foodie in me wants to say Julia Child. I bet both the food and the conversation would be fabulous. A really good steak with mashed potatoes and gravy, green beans almondine, a huge salad, and some sort of ice cream dessert that involves chocolate and peanut butter (my two favorite foods). Shannon, thanks so much for your interview! I agree, dinner with Julia Child would be scintillating. One would have to hope that she cooked the meal as well! Our home is now quiet again, and seems a little bit larger than it did before we hosted my family reunion for nearly two weeks. 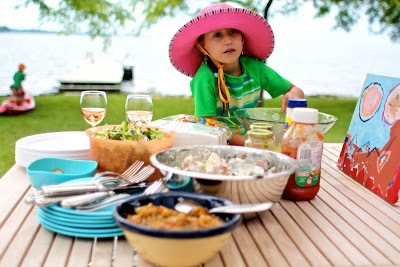 We had such a wonderful time and the days flew by in a stream of good great food, fantastic wine, perfect weather, laughs, adventures and about 10,000 photos. Oh my, did we have a lot of cameras going. 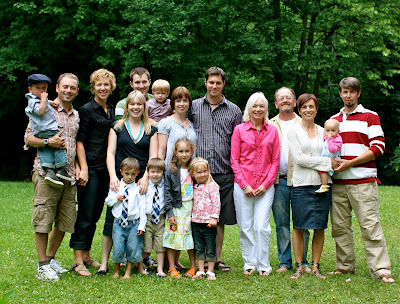 All of us! 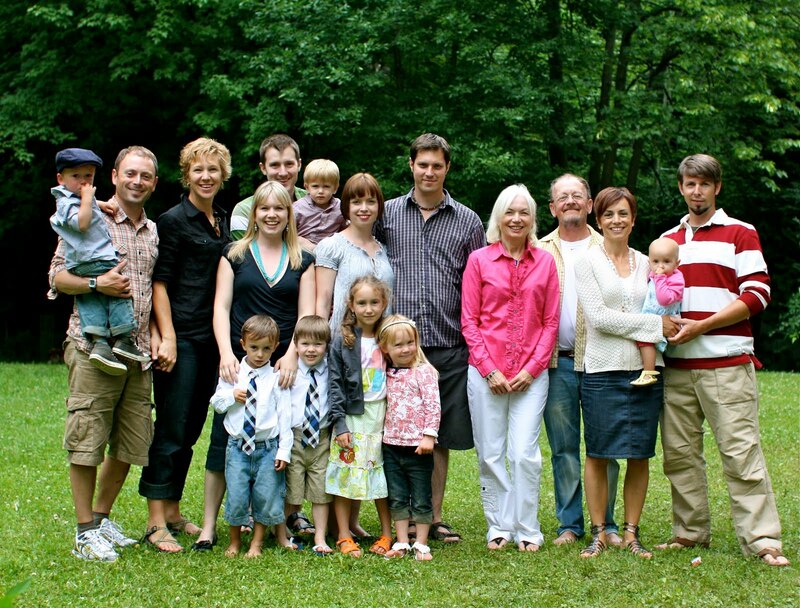 Love those people! 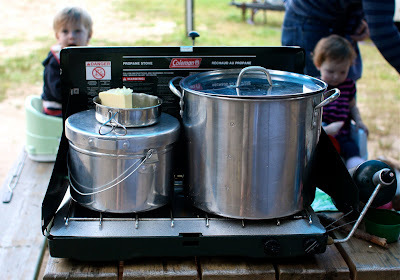 I'm not even going to attempt to recap everything we ate and cooked up together, nor the adventures and escapades we got up to, for they were all epic. "Epic" was the word of the reunion, from the production of getting the entire gang pictured above to the heart of the Montreal International Jazz Festival for a live Brian Setzer concert (with oh, about 150,000 other people), to each meal we sat down to, squeezing all 17 of us around two tables pushed together (oval tables- how awkward is that). Epic. In the very best of ways. 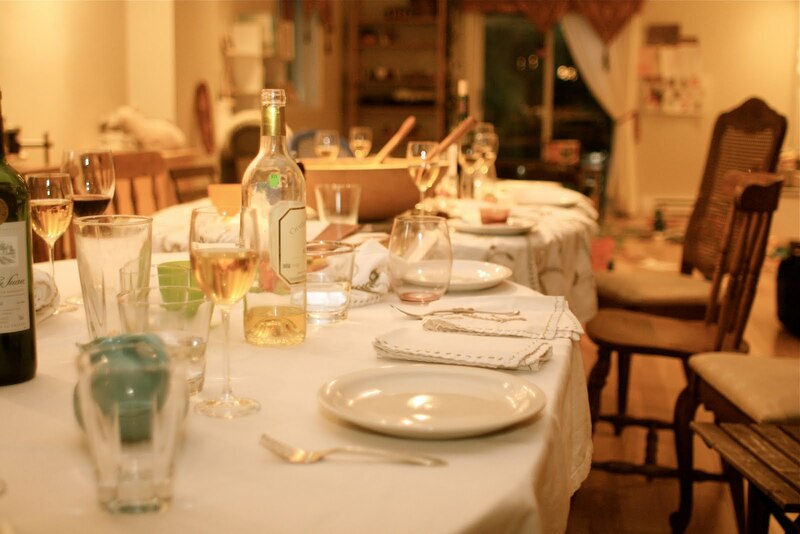 The best part of sharing your kitchen with others is the great recipes they bring and new suggestions that get you out of any cooking rut you may happen to be wedged into. My sister Haidi tossed up this fresh and vibrant salad for a little party we through for friends. Served alongside sliders, made with our local beef, the salad was filling, satisfying and a nice change-up of flavors from my usual salads. Add a fresh strawberry sundae to round out that menu, as we did, and you have yourself a pretty fantastic game plan for summer entertaining. 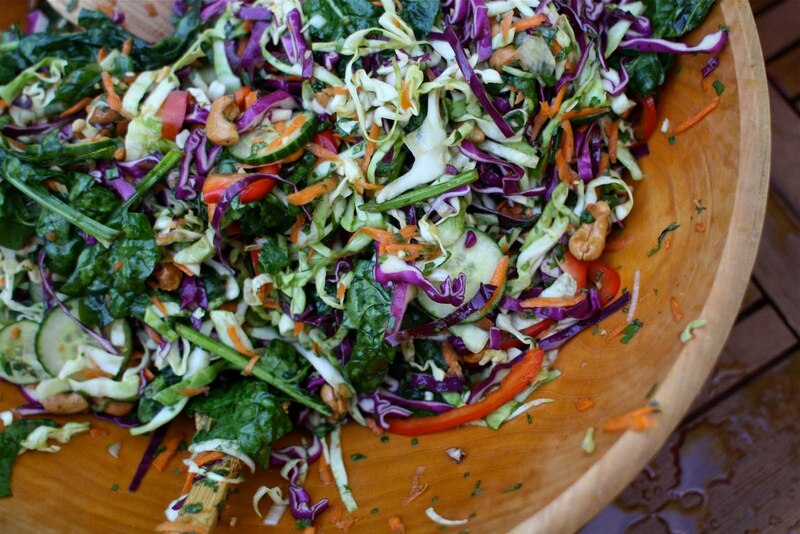 Lime, cilantro, sesame oil, ginger and jalapenos are just a few of the flavors that make this salad a party in itself. They all are combined in a kicking vinaigrette that coats crunchy cabbage (green & red), cucumber peppers and baby spinach. This lovely recipe comes via Ree of The Pioneer Woman, and is a clone of her Thai Noodle Salad, minus the noodles, obviously. We also left out the bean sprouts, but that was an oversite due to the amount of people and kids running around - or lack of sleep, who knows. Head to The Pioneer Woman Cooks for the recipe - and a whole lot of 'how-to' photos. Holy Smokes! Try her version, or leave out the noodles and bean spouts and make our veggie-lovers special. Enjoy! Happy Independence Day weekend to my friends to the south! 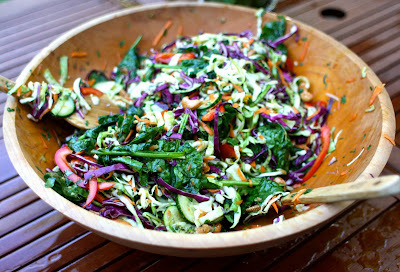 If you're stuck for a cool salad idea for your backyard barbecues, I highly recommend this salad for a change of pace.